One of my least favourite countries. I really didn't like it. Hassle , overcharging, bureaucracy, corruption, an oppressive climate and not much to see. oh and I was in a coma with hepatitis and malaria one week after leaving. I had high expectations, because when I lived in Southern African people I met who had travelled overland all the way from Europe told me that Ghana was the friendliest country in the whole of Africa. Maybe the general economic decline and dilapidation has hardened many people and turned them into a class of exploiters (after all this is the country where slavery was invented ...by the natives !). The aid budget is 99% squandered on such things as big shiny new cars for important people. Culture At first I thought the culture was very similar to the West; people work in a capitalist society, spend their money in shops, go to school etc. But after a while I began to realise that underneath West African culture is completely different, perhaps even more so than the deep differences between the West and Japan. I can understand how a West African could adapt to living in the West , but a westerner will always be an outsider , especially if they are not black skinned. Fundamental Western values like a sense of privacy, honesty, equality, fairness, a work ethic are too good to give up. Some of the fundamental Ghanaian cultural values are not nice..it's OK to lie, take bribes etc. There are some really good people in Ghana, but you rarely meet many. There are a large number of people who are initially very friendly and show an interest in you, but ultimately they usually want something from you. The UK is a very rich country and I am used to seeing a lot of poverty in other countries (though of course the ruling classes are always substantionately well off), but West Africa is the first place where I have seen the larger part of the population living in a mostly Stoneage way. Colonisation meant that a western face was stuck onto the body of West African culture. Underneath there are some pretty disturbing fundamentals. Jealousy and greed form the basis of the religion. When you go and see the native priests (juju man in Ghana, voudoun in Togo and Benin (Voodoo sic)) you don't ask for a prayer to be said for your success, but rather that all your neighbours chickens will die. In Ghana there is the worst kind of Christian fundamentalism TV evangelist style where people think it is important to go to church but not so important to behave in a Christian way outside. Under the surface people are generally still influenced deeply by tribal beliefs. There are many shocking things ..slavery still exists ..In the East of Ghana a man raped his cousin. A western concept (not necessarily right) is that he must be punished, but in that particular area the concept is different people believe that the bad is in the family not the individual. He gets off scot free. It was agreed that the family would be punished by his 8 year old sister being remove to the house of the priest mystic where she would be his servanr and as soon as she is ready his sexual servant. Perhaps when he is tired of her and he has some younger girls she will kicked out and allowed home. Highlights - Land of history, sophistication, beautiful buildings, parks, theme parks. No not really . Ghana is pretty boring ; it shows you how good as travel destinations other counties are and also how corruption intrinsically present in the culture screws up the country. Often it was a travel experience rather than a pleasure. The European castles are the architectural highlights, but now they are $5 to visit. (I am not trying to be nasty as in many cultures buildings for living people are not considered important and there is nothing wrong with that it's just that there isn't much to immediately capture the interest and imagination such as the architecture of say somewhere like Italy. One fascinating but immediately apparent thing that I learnt is that slavery was never a purely white oppressing black business. You can see the cruelties of the slavery business and the realities that it was the natives who organised the sale of other tribes and their own people. On the first day Ghana was quite different from what I expected. The customs man at the airport held the passports of 2 travellers and led them out to his brothers taxi. They ended up paying a pretty extortionate fare. When I got into my hotel room I found that the lock on my bag had been broken and my rather cheap camera was missing. I heard other stories that the luggage carousel workers helped themselves to peoples goods. As it was the first day I was cautious about the tap water and went off in search of bottled water. At a stall I was qoted a really expensive $1 , but I was so thirtsy I paid and started gulping it down. Irealised it wasn't very cold and then I thought I didn't need to break a seal ie they had quickly filled a bottle with tap water..(now I have no problem about grabbing a bag of "ice-water" from the street hawkers for 1c. As I walked around peole were very forward in coming up to me sking me where I was from and when I said England they wanted my address. I soon found out that they were after an address to use on the visa application form. Whilst I was in Ghana I was asked for address dozens of times, usually in such a way where I found impossible to say no; I just gave the address of the Ghanaain Embassey in London. Fan Ice is the best thing in Ghana. Cheap frozen yoghurts & lollipops sold by bicycle boys which taste good and really cool you down. They should export them to the UK ! Cheap Transport petrol is 20 times cheaper than it is in the UK. Though outside big places you can have a long wait as not everyone can afford to use it. Street Food - you can buy very cheapfood from very common roadside stalls. Pity about the local tatses though, the bases are usually very bland then the sauces are overpowering chili spice. Sunshine 12 hours a Day unfortunately the 6 hours in the middle of the day are just too hot. Also West African people do not share western enthusiasm for living near to the sea so in Accra for example there are few buildings on the sea front to take advantage of the cooling sea breeze. Artistic things ..dance, drama and drumming - performers really do seem to work hard . It's strange there is no western type work ethic for most things, people seem really lazy. Internet Access - there are 4 places in Accra and some communication centres in Kumasi. 2. Africa Online - they have a demonstration machine in there office; so you can use the internet for free. You sometimes have to wait because there is only one machine. location - 1 Km from Nkrumah Circle, go west then turn right at the first lights (outside the CAT dealer) and then 300m to the 4 storey building. 3. NCS a subsiduary of Digital have one machine in their office with fast access. location- 500m away from the ring road, get off the Tro Tro just before Sankara circle and walk south on the back street which goes behind the immigration office. Aquarius Restaurant : this expensive German restaurant used to be great because they had free internet access, but now they have a coin slot 3000 Cedis for 15 minutes location- 1 Km east of Dunquah circle, from the ring road follow the signs through the back streets. I spent a few days in Accra, took the STC bus to Cape Coast, visited Elmina and takoradi before spending a couple of days staying at the castle in Princes Town. Then I travelled up through the goldfield region stopping off at Taquah, Dunquah and Obassi. I spent a few days in Kumasi before traveling through the hillls to the hill station at Aburi and then back to Accra. I then visited the east of the country; travelling to H0 , stopping at a hill village Mohamed Al Zofe and fleeing across the border into Togo. Accra - A huge sprawling city. The most run down capital I have ever seen. Because it's so spread out you can spend a lot of time waiting for and riding tro-tros. At commuting times there are often hours of gridlock ! Cape Coast - A sprawling town of run down streets. The casle and museum are quite interesting , but now the government has institutes a policy of charging much more for foreign tourists so the entrance fee is up from 30c to $5. Elmina - similar to Elmina, but a little more picturesque. The castle has been extensively rebuilt by American Aid projects (guilt money to buy black votes ?). I bribed the watchman to let me into the castle wich would have beeen $5. Takoradi - The 3rd largest city. Another port with run down streets and not very interesting at all. PrincesTown - A small isolated beachside settlement. Its 10Km off the main coast down a very rough track and the drivers take the oppurtunity to make some extra money by charging people way extra for thier bags (well its probably only 20p but a lot on a local scale). You can stay at the uninhabited castle for CD5000. It would be a great place if there are a group of you, imagine sitting on the terrace witha few beers enjoying the beautiful view down onto the beach and sea below. Road to Kumasi pretty bad with large craters -were they blown up in fighting ? Ho- neither town or the museum were at all interesting. Mohamed Al Zofe - I thought it would be more interesting to visit a small town. The hour long journey by pick up through the hills was absolutely terrible. Unfortunately, because it was a small town. I managed to get an "I'll be your guide", man on my back straight away. He invited me to his aunts house for dinner and then presented me will a bill for 5000 $GS, charming elsewhere the same food wouldn't have been more than 500 $GS. 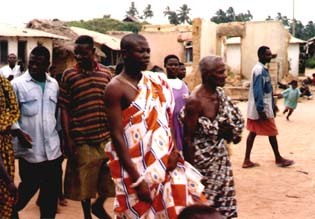 Then as is the custom I had introduce myself to the village chief. Other chiefs I had met before had been hospitable and kind these villages made it clear all they wanted was a bottle of gin. I felt exploited, because of this form of tourist tax. Kpalime (pronounced with the customary silent K) Because I felt so negative to Al Zofe I fled on the first vehicle out to the Togolese border. It was a quite frontier so I had to walk for about 6 Km and the passport control didn't even notice I didn't have a visa. I changed money with the money changer on the border and made it to Kpalime by collective taxi. Togolese towns also have a rundown look after a more glorious past. a lot of guides waiting for rich French Tourists to pay them big money.